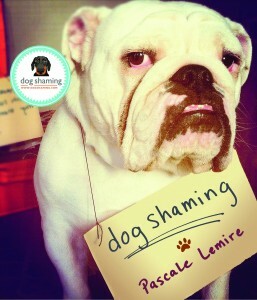 Posted May 20th, 2015 by dogkeeper & filed under mailman meanies, Pilfering Pooches, Submitted. 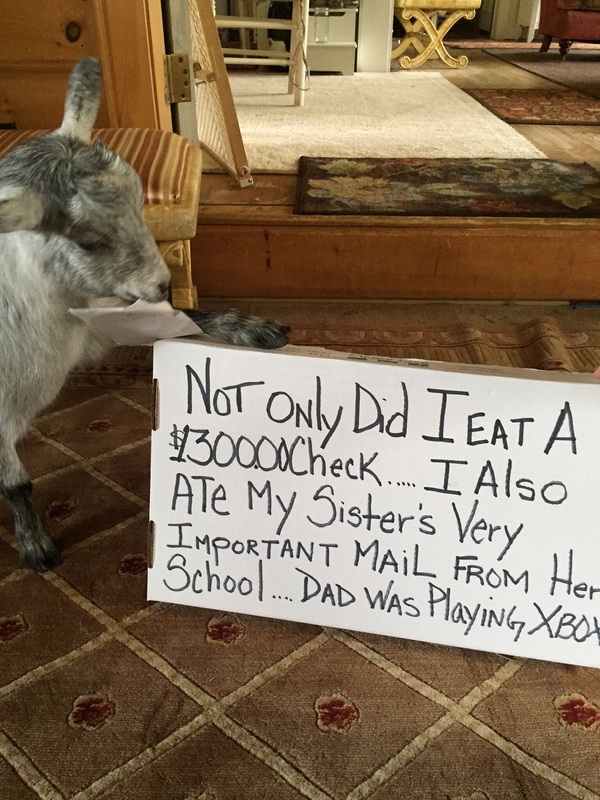 Roberta rose our goat loves to eat everything. Posted January 10th, 2015 by & filed under Best Friend Betrayal, Submitted. 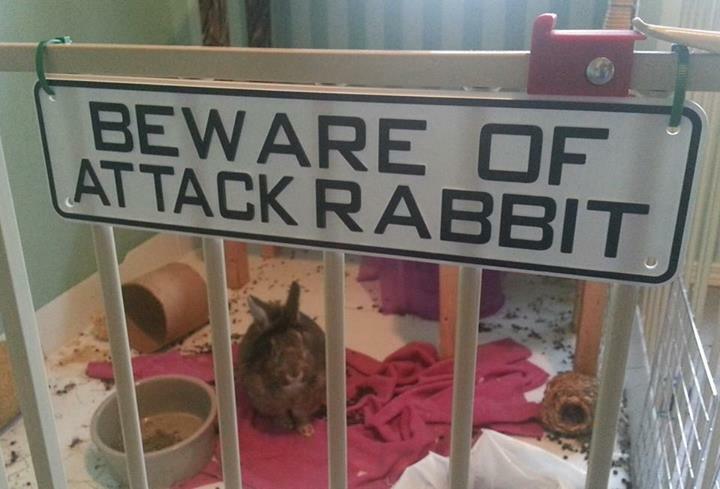 Stewie got this sign for Christmas after she bit a chunk of fur out of her kitty brother’s neck because he always tries to eat her hay. She also chases the dog and steals his toys. Posted August 30th, 2014 by & filed under Best Friend Betrayal, Submitted. I had to leave work early with a migraine headache. 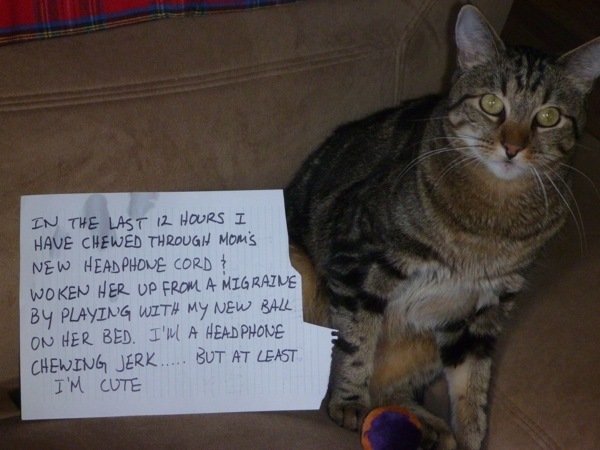 I came home to find that Pogo had chewed through the cord on my *brand new* pair of headphones. And I woke up from my migraine only because Pogo decided to play “kill the ball” on the bed and under my covers. It is a darn good thing that he’s cute. I must a-ski for your assistance! Posted August 26th, 2014 by & filed under Submitted, Who's Training Whom. 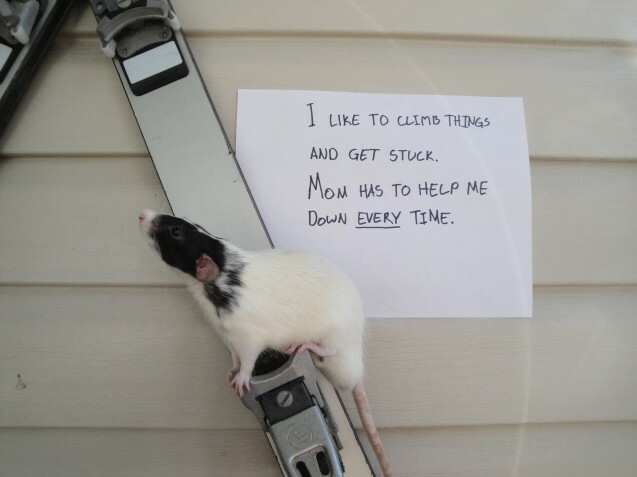 I like to climb things and get stuck. Mom has to help me down EVERY time. 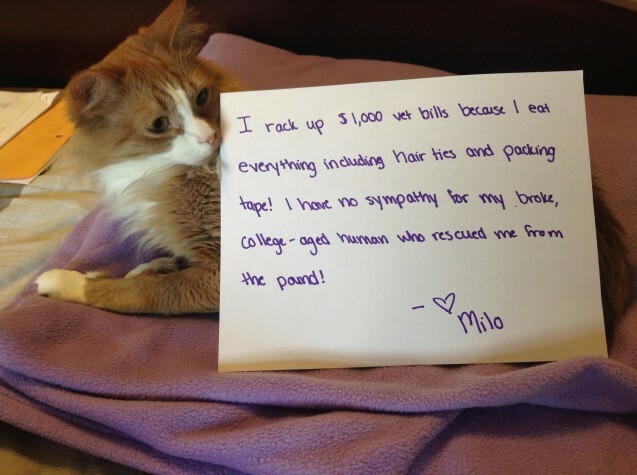 Posted July 20th, 2014 by & filed under Pilfering Pooches. 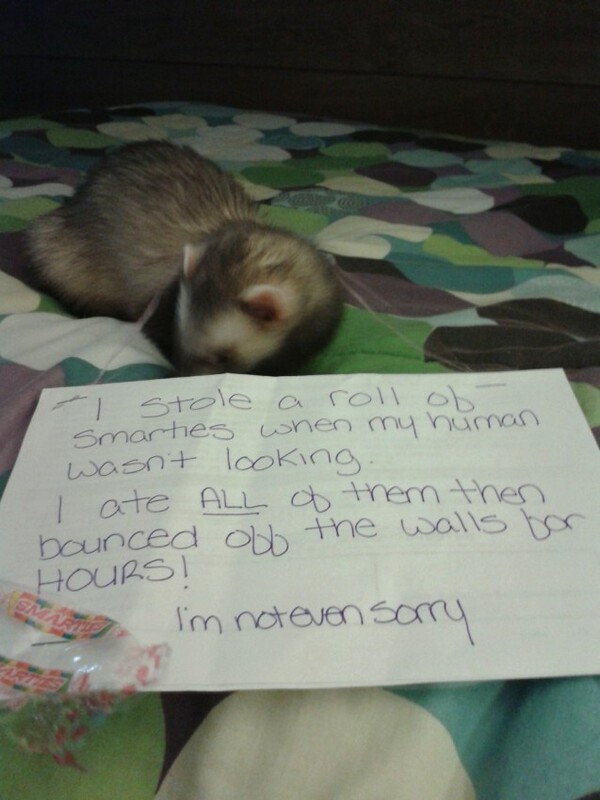 This is my ferret, Gracie. She is a ninja and a thief. She makes no noise when she steals stuff and I often don’t realize anything is missing until the next time I need whatever it is. Posted July 12th, 2014 by & filed under Submitted, Underwear Snatchers. Posted January 22nd, 2014 by & filed under Submitted. 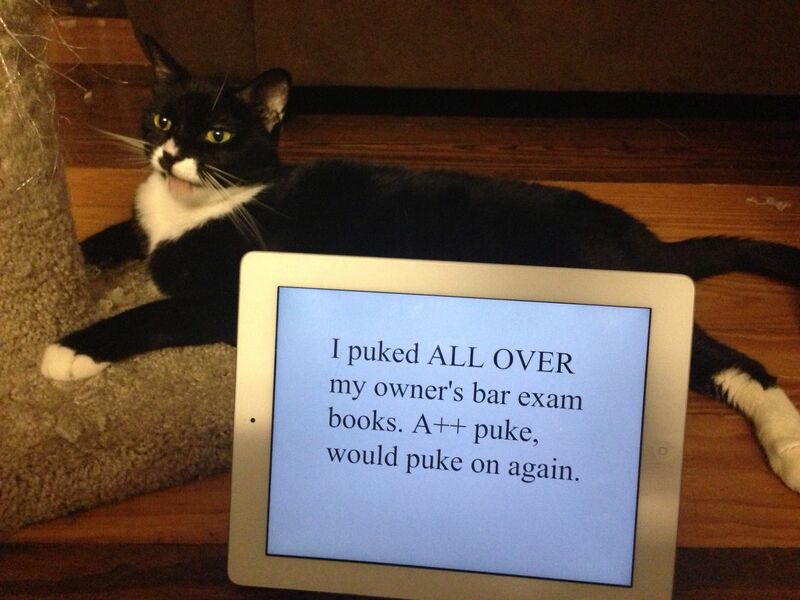 I puked ALL OVER my owner’s bar exam books. A++ puke, would puke on again. Posted January 11th, 2014 by & filed under Submitted. My cat, Bagheera, thinks that since the computer charger has the name “Apple”, it’s okay to eat. 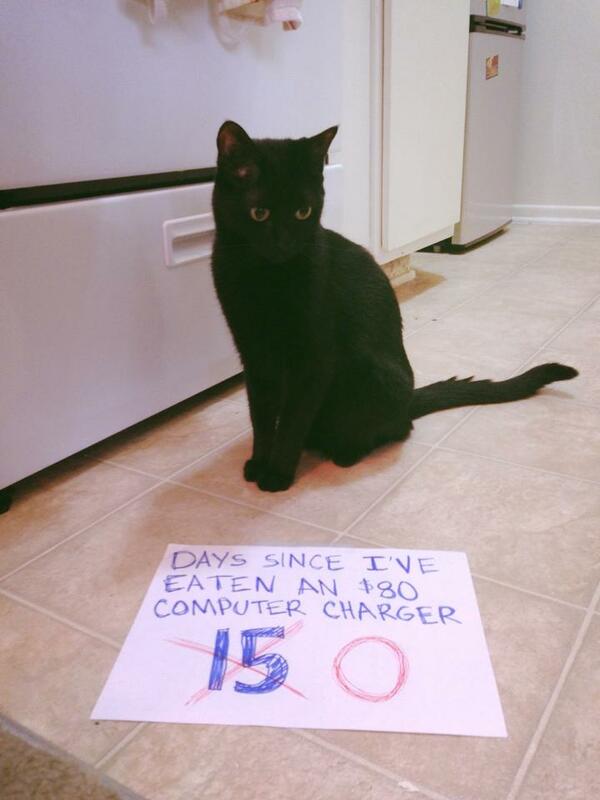 He has eaten 4 too many computer chargers during his 1.5 years on earth…. Guess what I ate today! 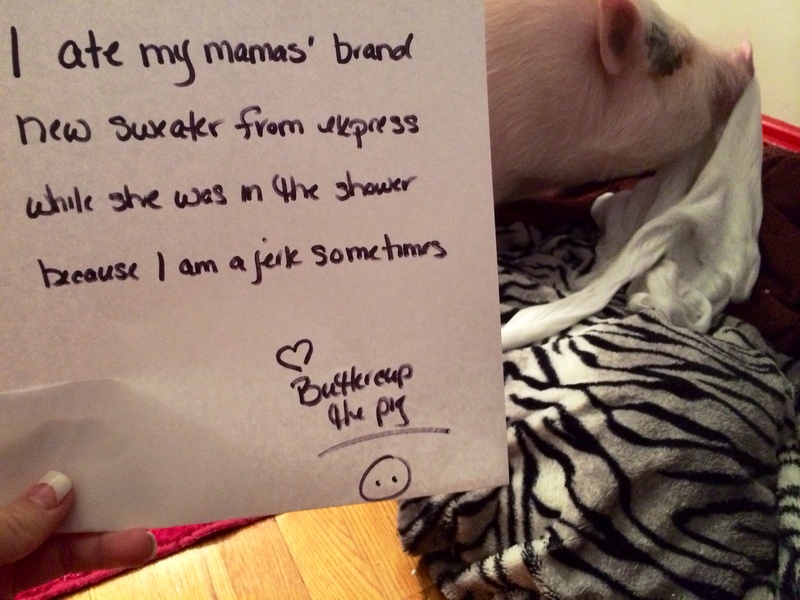 Posted October 3rd, 2013 by & filed under Submitted.